We decide our new daily motto is: “Building the NEW”. And, by “daily motto,” I mean something we literally say and remind ourselves of over and over again so that we actually LIVE according to our new motto. We zero in on “Building the NEW” so much that it overshadows any doubts or frustration that things haven’t fallen into place yet. 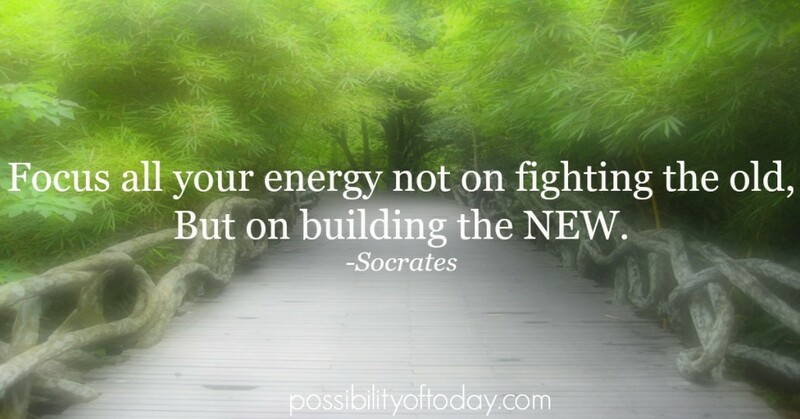 It’s all about building the NEW. If you ever start worrying about things working out or your mind keeps rehashing things that went wrong, remind yourself of our new motto–It’s all about moving forward today. You’re building the NEW. Remember, Change Takes Time. Don’t Be Too Hard On Yourself. Now, any real lasting change we make takes time (despite the world telling us otherwise). And we might not instantly follow through on what we know is best for us. We don’t always go to the gym when we say we will, we save that project for the last possible minute, we try to stay positive each day but wind up complaining. If we let it, our lack of following through can feel like failure and chip away a little at the belief we have in ourselves. But, sometimes we’re being too hard on ourselves because at least we’re trying. We’re setting the right intentions. We’re learning, making changes and getting better. That’s why I love this motto, “Building the NEW”. It’s simple. It focuses us in on making progress and letting ourselves off the hook for any mistakes we made in the past. It reminds us that we are “Building” something each day and as long as we’re moving the blocks that are put in front of us that day, we are Building the NEW. Life shifts. Tomorrow will look different than today. Two weeks will look even more different. But, it’s all influenced and shaped by the small steps we take and what we choose to do now. In so many ways it’s just like following a path to hike up a mountain. You can’t really see around all the twists and bends. You don’t know exactly what’s coming, but you know if you keep walking, taking the step in front of you, the path keeps unfolding a little more and a little more. There’s no need for any frustration, confusion or doubts, because as long as you keep going, you’ll reach the top. Remind yourself that whatever you’re working on today is no different. Stay on the path, keep your head up, take the steps forward TODAY that you can. Build the NEW…you’ll reach the top. Here Are 3 Specific Tips To Help You LIVE By Our New Motto. 1. Designate a time everyday to take an actual step forward. Just because we know we should do something, doesn’t mean we will actually end up doing it. In fact, I should be doing my taxes RIGHT NOW, but I’m not. It never happens until I actually block some time on my calendar that I do them. We’ve got to get specific and schedule time because making progress doesn’t happen automatically. 2. Stop asking yourself pointless questions like … What if it doesn’t work out? What if everything falls apart? These questions are invented by our Chief Negativity Officer and they don’t help us figure anything out. They just repeat in our minds over and over again, drain our good energy and take our attention away from “Building the New”. 3. Align your mind with getting inspired and taking steps forward every morning. Boost your mood by taking time to say thank you for what’s already working in your life. Say thank you for 5 specific things you can think of and really FEEL it. Genuine gratitude will instantly outshine any bad mood, frustration, sad thoughts, procrastination, etc. It’s literally impossible to have a gratitude thought and a negative thought at the same time.